Barclays Personal Loans Review: In-Depth Look for 2019 | SuperMoney! Barclays is a global bank headquartered in London, with roots tracing back to a goldsmith banking business established in 1690. It has grown over the last 300+ years to serve customers in 40 countries, including the United States. Barclays US offers American citizens credit cards, savings accounts, CDs, and personal loans through a fully digital experience. In this in-depth review, we’ll investigate the bank’s personal loan offering. 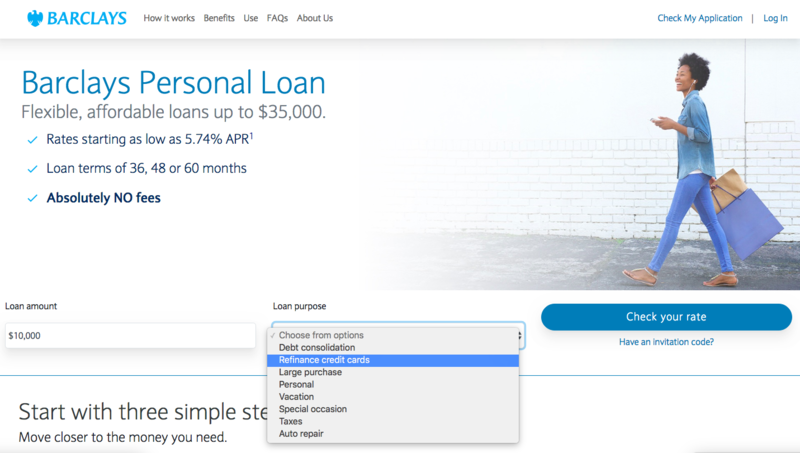 Barclays US offers unsecured personal loans ranging from $5,000 to $35,000, with loan terms spanning 36, 48, or 60 months. Your annual percentage rate (APR) will depend on your creditworthiness, loan term, and loan amount. You can prequalify for rates through the lender’s online application (which won’t impact your credit score). Aside from the interest, there are no other fees. That means no origination, application, prepayment, or late payment fees. This is a huge benefit, and strongly differentiates Barclays from the rest of the lending marketplace. If approved, you’ll receive your money within a few business days. Barclays can deposit it into your checking account, or you can apply it to up to five credit card balances. Interested in applying for a Barclays personal loan? Here is how it works. 3. Provide your loan purpose, name, address, resident status, monthly income, occupation, email, social security number, and date of birth. That’s it! Just click ‘Continue’ to find out if you pre-qualify and learn your rate and term options. 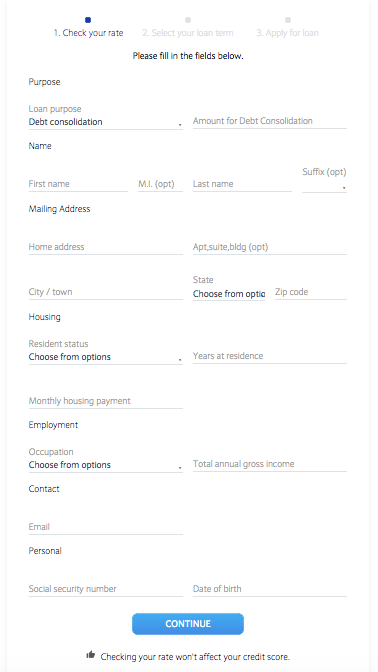 If you want to move forward, select a rate/term and submit the full application. But remember, the formal application will result in a hard inquiry on your credit report, which can affect your credit score. Barclays US offers a secure customer website and mobile application where borrowers can manage their loans. Just log in to make payments, view your transaction history, check balances, set up automatic payments, and more. The website is also accessible from your mobile device. Note that Barclays US does not send paper statements for its personal loans, so you must use the customer service website. If you prefer physical statements or face-to-face interactions with your lender, this may not be the loan for you. Barclays customer support is available 24 hours a day and seven days a week. Self-service options are also available through the mobile app or website. The mobile app is available in the Apple store and Google Play Store. If you need to discuss sensitive information, you can send messages through the secure message center. You can also tweet general questions to @AskBCUS, or find the company on LinkedIn, Facebook, Instagram, Google Plus, and YouTube. Barclays offers competitive personal loans. Whether a Barclays loan is right for you depends on what you qualify for, and how it compares to other offers available to you. Will Barclays give me a loan? You can find out by checking your rates on the website. The process is quick and won’t hurt your credit score. How long does it take for Barclays to process loan applications? After you submit all the needed information, Barclays can approve you as soon as the same day. However, approval for most applications will take 1 to 3 business days. Can I pay off my Barclays loan early? Yes, you can pay off your Barclays personal loan early and will not be subject to any penalties. Do I need an invitation from Barclays to get a personal loan? No, you don’t! While you previously needed an invitation to get a Barclays personal loan, this is no longer the case. Barclays does still send out invitations, but anyone is welcome to apply. Is a Barclays personal loan right for you? Well-established in the industry and worldwide. Lack of physical branches may be problematic for some customers. Must meet qualification requirements to access loan. Loans for less than $5,000 are not available. Lower APRs may be available elsewhere. If you are happy with an online-only lender, Barclays may be a great fit. The loan range ($5,000 to $35,000) will be enough to cover many types of common expenses. Further, the lender’s lack of fees sets them apart from the competition. However, if you need to borrow more than $35,000 or less than $5,000, look elsewhere. Additionally, if you haven’t established any credit or have bad credit marks, you might not get approved. And if you aren’t tech-savvy, you may want to look for a loan solution from your local bank or credit union. Interested in a Barclays loan? You can find out what Barclays can offer you without even leaving your house. Just be sure to compare the offer against at least two quotes from other lenders to ensure you’re getting the best deal. When you are ready to find your best rate, head over to SuperMoney’s personal loan engine to get competing offers in minutes!